Pick Up will take place April 29th through May3rd from 9am to 4pm and May 4th and 5th from 8am to 2pm in the Haley Center Lobby. Bring pink receipt or photo ID to pick up regalia. The pink receipt will guarantee pick up. If you provide only a photo ID and we cannot find record of your purchase,you will be required to pay the rental fee to get a cap and gown. Regalia must be returned immediately after the ceremony. Please take photos prior to the ceremony. Stop by the AU Bookstore to place your order, or order online here! The Auburn University Bookstore facilitates orders for rented regalia for each of Auburn University’s graduation ceremonies. Regalia is rented from R.M. Hendrick Graduate Supply House. 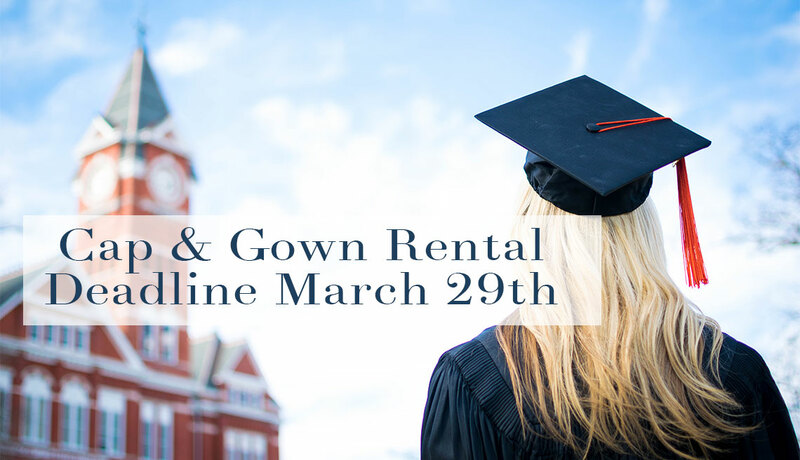 Rental of a gown includes a cap and tassel from the graduate’s college or school that may be kept after the ceremony. Gowns are returned at the Auburn Arena immediately after the ceremony. Please take photos prior to the ceremony.